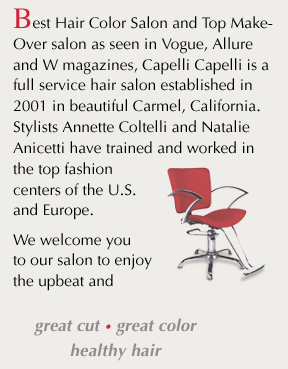 Best Hair Color Salon and Top Make-Over as seen in Voque, Allure and W magazines, Capelli Capelli is a full service hair solon established in 2001 in beautiful Carmel, California. 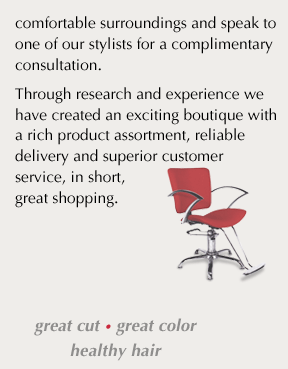 Stylists Annette Coltelli and Natalie Anicetti have trained and worked in top fashion centers of the U.S. and Europe. We welcome you to our salon to enjoy the upbeat and comfortable surroundings and speak to one of our stylists for a complimentary consultation. Through research and experience we have created an exciting boutique a rich product assortment, reliable delivery and and superior customer service, in short, great shopping.